Can we take just a second to let it sink in that 2013 is half. way. over. WOW! And June was another rockstar month! I shared our engagement pictures (set 1// set 2), met some amazing women at the Southern Blog Society Brunch in Atlanta, hosted the first (with more to come!) BlogNashville events, traveled to NYC with my sister & bought a wedding dress! Did you have a favorite of this month's outfits? How was your June? Any big plans for the 4th or the rest of July? P.S. Don't forget to enter to win this week's giveaway - fabulous jewelry from Yuni Kelley! My fave was the coral dress with the denim jacket and gold belt! I bought a fedora from Target that I feel similarly about. I don't want to take it off! 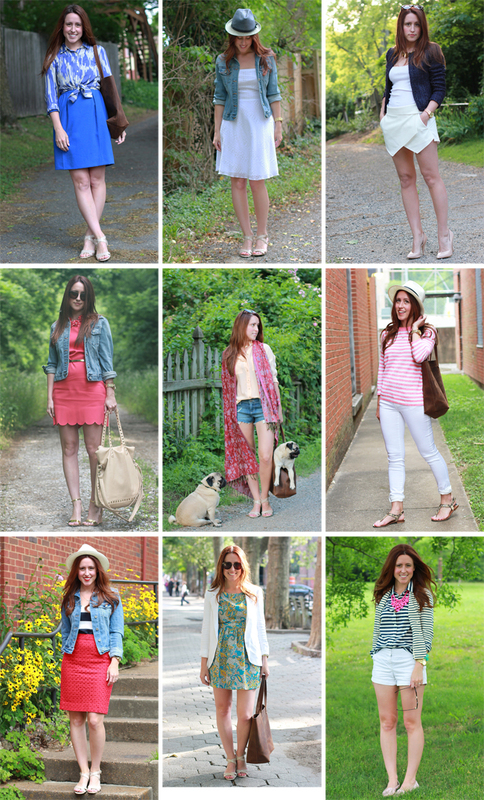 All if your June outfits are fantastic! you're looking so put together and stylish! I pretty much loved all of your june outfits. My favorite is the first one and the bottom middle. SO cute! My fave was the stripes on stripes with the white shorts and pretty pink necklace. My June was trying at times with my 14 yr old son, but we became closer. I discovered Elizabeth Strout's books and went on a reading binge. I'll probably attend the big festival here in Centerville, OH. It's really wonderful lots of art's and crafts hopefully it won't be too hot. love all the stripes!! so many cute outfits! YAY for outfit recaps! And seriously, where has this year gone?! Can't believe it is July already - crazy!! Loving your outfits though, can't wait to see more! Love that last outfit with the white shorts! So cute. Your style is darling. I'm still obsessed with that skort! Love it! They're all so cute!! I think my favorite is the one with the white pants and the pink top. I loved your skort outfit and the scalloped dress look! It sounds like you had such an amazing June. I hope July is just as fabulous. I can't even pick a favorite! I absolutely love your scalloped dress, and you wear that hat so well! Also, big news... you've inspired me to set a budget. I'll be posting about it today on my blog! Hi Jessica! So I have a lot of catching up to do, but I will say, I'm loving the white blazer/printed dress combo best!! Also, I'm finally back in Nashville, so bring on the BlogNashville events! Loving all of these! Especially the top right! Is that from Zara?! I can't believe that half the year is gone! It feels like we were just starting 2013 - oh well I shouldn't complain, at least summer's here! I love all your outfits, but your scalloped J.Crew dress is my favorite! the paisley dress and eyelet skirt are my favs. well done lady!